AEV’s DualSport 2.5-Inch XT Suspension System was designed to appeal to Jeep JK Wrangler owners who want the added highway and trail performance of AEV’s taller 3.5 and 4.5-inch DualSport Systems, but with a reduced lift height. As with AEV’s 3.5 and 4.5-inch systems, painstaking attention was paid to tuning and geometry in the new system. Not content to simply borrow the same spring rates and shock valving of the taller systems, AEV set out to specially tune coils and shocks that are unique to the needs of the new, lower system. The result is new frequency-tuned, triple-rate coils at all four corners and custom-tuned Bilstein shocks matched to the coils. Additionally, AEV evaluated the new system for cornering and braking and determined that a new, geometry-corrected rear Track-Arm Tower would be needed to help create the kind of handling AEV suspension systems are expected to have. The new system is rounded out with everything else needed to complete the package. This includes a custom rear track-arm, front stabilizer end link relocation brackets, bump-stop extensions and brake line relocation brackets. Combined with the springs and shocks, these components allow AEV’s DualSport 2.5-Inch XT Suspension System to deliver classic AEV on and off-highway performance, exceptional reliability and a lower, more user-friendly lift height. In simple terms: OE-style tuning. With the benefit of a former Chrysler suspension engineer on staff, we began by optimizing the JK’s rear track-arm geometry to accommodate a lifted ride height. We then proceeded to develop custom progressive rate coil springs and custom-tuned shocks. All of this development followed factory engineering methodology. The overall goal was to not only build a lift, but to create a fully tuned suspension that would enable a lifted JK to equal or outperform a stock one in all driving environments. In the 4WD suspension aftermarket this is truly a high water mark given that for decades the focus has primarily been on looks and wheel travel. Is there a difference in performance between the 2.5” DualSport Suspension Systems and the taller 3.5/4.5” Systems? On the trail, the taller systems will obviously have the advantage for ground clearance. For this reason it will be important for you to consider just what kind of trail work your JK will do. For example, if the boulders of the Rubicon will be your Jeep’s regular playground then the taller lifts make sense. But if your Jeep’s future will mainly involve general exploring and ‘overlanding,’ then the lower lift should be perfect. Beyond ground clearance there is also the question of wheel travel, but in this category the performance will be very similar between all of the DualSport Suspension Systems – regardless of height. On the highway there is a noticeable cornering and steering advantage to the taller lifts in “SC” or “RS” trim because they include AEV’s High-Steering Kit. Whether the typical driver would notice this difference compared to the lower lift is difficult to say. Also, keep in mind that the lower lift has a lower center of gravity which provides corning benefits of its own. On the highway there is also an anti-dive comparison that can be made between the lower and taller systems. AEV’s taller lifts include Geometry Correction Brackets for the front control-arms and these improve both anti-dive and bump response. However, Geometry Correction Brackets are available as an option for the lower, 2.5” DualSport Suspension System. What parts are different between a 2.5" DualSport Suspension System and the taller 3.5/4.5” versions? Can I upgrade easily? If you compare the 2.5” DualSport XT Suspension System with the “SC” versions of the 3.5 and 4.5” systems, there are many differences. The springs, shocks, bumpstops and rear trackbar tower used in the 2.5” kit are all unique and different from what is used in the 3.5” and 4.5” kits. 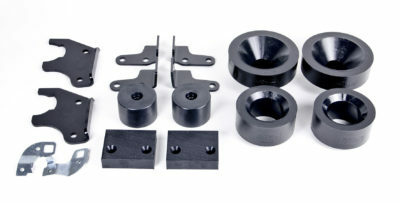 The 3.5” and 4.5” kits also include a High Steer Kit, Front Control Arm Drop Brackets, ProCal and Jack Base. This leaves only the rear track bar and the brake line drop brackets as common parts between the kits. In short, it won’t be an easy upgrade to move from a 2.5” kit into either a 3.5” or 4.5” kit. Your rear track-bar tower is taller than all the others I’ve seen and even comes with a new track-bar – why? Why don’t you supply adjustable track-bars with your DualSport Suspension Systems? The 2.5” DualSport Suspension System does not offer a High-Steering Kit like the 3.5 and 4.5” Systems - why? Because the 2.5” DualSport Suspension System offers milder lift, this means the chassis remains closer to the axles. Consequently, the space required to add in a High-Steering Kit is greatly diminished. However, AEV’s engineers discovered that a High-Steering Kit was not necessary on the 2.5” system because the geometry of the front drag-link and track-bar remain more neutral and closer to stock than with our taller systems. The center of gravity also remains lower on the 2.5” system so it was not necessary to reposition the front roll-center via a raised track-bar. Yes and no. The shocks are exclusively made for AEV by Bilstein and carry their own unique part numbers. Their basic construction is in fact identical to the 5100, though they are specifically sized to AEV’s specs to fit our JK suspension. This is good news because Bilstein arguably makes the best all-around shocks available. But these shocks are special in other ways too. This is because they contain valving that was specifically tuned for our suspension by a joint effort of AEV and Bilstein engineers. The final tuning was the result of many hours of ride and handling test iterations which were performed on Chrysler’s own proving grounds. This is in contrast to the shocks and tuning of many other aftermarket suspensions where a middle-of-the road approach is often taken. This is done simply to avoid the outlay of time and expenses required to properly test for, and develop, proper tuning. Think of AEV’s approach like a well-tailored suit versus an off-the-shelf version. AEV’s 2.5” DualSport System does not include replacement control-arms – why? AEV chose not to let traditional suspension norms drive the content of its JK DualSport kits. A good example of this would be control-arms. On the older Jeep TJ the arms were weak and short. So it was desirable to replace them with something stronger and often longer. But with the JK, the factory control arms are plenty strong right out of the box. They are also substantially longer, which improves geometry. And finally, they come with very high-quality rubber bushings which outperform the typical aftermarket urethane or even rubber bushings in just about every meaningful way. So you won’t see custom control arms in AEV’s DualSport Suspension Systems. What size tires can I run with the 2.5” DualSport Suspension System? This is always a tricky question because there are so many factors involved such as wheel width and offset, body/fender modifications, spring rates and bumpstop spacing, etc. The short and simplified answer is that if running our wheels (or dimensionally equivalent), we recommend up to a 35” tire. Other popular choices include the 255-80R17, 285-70R17 and 315-70R17. Can I use my stock wheels with AEV’s 2.5” DualSport Suspension System? Yes, AEV’s 2.5” DualSport System is compatible with either the 16”, 17” or 18” factory JK wheels. Do I need to make exhaust modifications to install AEV’s 2.5” DualSport Suspension System? No exhaust modifications are required. Why should I add Geometry Correction Brackets to my order? These brackets are standard on our larger lifts, but optional on our 2.5” kit. Geometry Correction brackets improve the ride for those who see a lot of expansion joint riddled freeways or washboard dirt roads. The first and most obvious thing that AEV’s Drop Brackets do is improve the approach angle of the front control-arms. If you look at a stock JK you will notice that the front control arms are nearly level with the ground. This is an optimal situation because when the front axle/suspension encounters a bump, the control-arms do not interfere with free upward movement. However, if the control-arms are steeply angled, as they often are on lifted Jeeps, they begin to interfere with upward movement. This is because the front axle/suspension must now move forward as it moves upward. This creates conflict and it reduces ride quality and handling. The Drop Brackets eliminate this by restoring near-factory positioning for the front control-arms. Why should I add AEV’s ProCal Module to my order? It is important to remember that the JK’s computer is designed to simultaneously monitor vehicle pitch and roll, vehicle speed, wheel speed, steering input and more. So what happens if the vehicle’s computer isn’t fed accurate information? The ESP system activates to correct for what it perceives as problems, even when problems may not actually exist. A good example of this is in regard to vehicle speed. As mentioned above, larger tires and lifted suspensions go hand-in-hand. Unfortunately as soon as the larger tires are installed, inaccurate information about vehicle speed is immediately sent to the computer. AEV knew this could create ESP problems when combined with larger tires, so the ProCal Module is offered as an option for the 2.5” DualSport Suspension System. This tool allows for easy speedometer recalibration – which means correct information is being fed to the computer. For those choosing to run the stock size tires on the 2.5” lift, the ProCal is not necessary. How will your 2.5” DualSport Suspension System handle towing a trailer? Can I use a drop pitman arm with your 2.5” DualSport Suspension System for better steering? No. While a drop pitman by itself is not a terrible concept, mixing geometry-altering components together indiscriminately, is! A drop pitman means that the track-bar must also be lowered at the frame end. We do not do this because it lowers the vehicle’s roll-center, which is undesirable. To then add a drop pitman with the stock track-bar in the stock location would give terrible results causing ‘bump-steer’ and creating an unsafe combination. As with so many of the original chassis components, our philosophy is akin to “if it ain’t broke don’t fix it”. In this case, the stock hoses are rigorously tested and built to endure everything you could ever expect of them – they just happen to not be long enough for a taller vehicle. Since mild reshaping of the hard lines is enough to allow additional length to accommodate longer shocks, going with the solution that saves cost and installation time (no need to bleed brakes) is the logical option. It should also be noted that with aftermarket hoses you still have to find more length in the ABS wires to match them and that replacing the brake lines will also require a trip to the dealer to go through an electronic procedure required to properly bleed the brake system. The first reason is that there is no significant benefit to adding long arms to a JK that is lifted in the 2.5-inch range. The second and perhaps more important reason is that the location of the fuel tank prevents having both good geometry and good ground clearance in a single long-arm design. If you’re going to spend more than twice the money for such a makeover, wouldn’t you want both? Since the JK’s stock arms are much longer and stronger than the TJ’s were, there is plenty of potential available without the tear up and expense of long arms. When you also consider the larger size and other aspects of the JK that make it more suited for ‘overlanding’ than rock-crawling, the best value for a JK (for the way most enthusiasts will use it) is a well-tuned short arm system. So that’s what we focused on. Where are AEV's DualSport Suspension systems manufactured? All of the components in our 2.5" DualSport XT System are made right here in the United States.